Whether you are new to the Army National Guard or Army Reserve, or you are a seasoned officer, I’d be willing to bet that you are looking for ways to excel your career! If you’re like most part-time Army Officers you’ve NEVER had any of your superiors sit down with you to help you map out your career. No one has ever taught you what jobs you need, when you need them, or how to get them. No one has ever helped you set realistic career goals or develop an action plan to reach those goals. I could go on and on here, but I’m sure you can relate to I’m saying. Simply put, mentorship in the USAR and ARNG isn’t what it should be. Fortunately for you, I’m here to fix that! My name is Charles (Chuck) Holmes and I am a former Army Officer (Active Duty and National Guard). During my six years in the ARNG I quickly realized that most officers didn’t get mentored like they were supposed to. Unfortunately, many Army National Guard and Army Reserve Officers feel overwhelmed and frustrated. They’re not happy with where they are currently at with their military career. Or, they feel like their military responsibilities have consumed their entire lives. Or, they feel stuck and don’t know what to do. During my six years in the Army National Guard, I read every book, manual, FM, Regulation and information product I could find about advancing my career. Unfortunately, I found NOTHING exclusively for Army National Guard or Army Reserve Officers. I found that very frustrating, so I decided to create and publish my own Army Officer Guide for part-time Army officers. Whether you are the Adjutant General in your state or are a newly commissioned Second Lieutenant, I have created an eBook that will help you succeed in your military career. 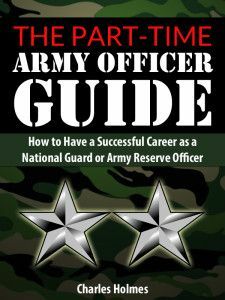 I am proud to announce my new eBook The Part-Time Army Officer Guide: How to Have a Successful Career as a National Guard or Army Reserve Officer. After reading The Part-Time Army Officer Guide you will know EXACTLY what you need to do achieve success as a part-time Army National Guard or Army Reserve Officer. This is an eBook (PDF) that will be delivered instantly via email, after you make your secure payment via PayPal. The information this course is worth at least several thousand dollars to you. Well, what would one or two additional promotions during your career be worth to you financially? How much extra money would that provide you in the years to come? How much more would that be worth to you in retirement income? Money aside, how much would it be worth to you to develop your potential, get the jobs you want and make a difference? Read my book and it can fill your mentorship void. You will learn what you should do at each rank and you will be able to create an action plan for your own career. If the information in this course can help you get promoted faster, that would be an extra $100 to $200 per month in pay. Over the course of one year, that would be an extra $1200 to $2400 in your pocket. And if the information can help you retire at a rank higher than you would achieve without this information, that could easily account for an extra $200 or more per month in retirement pay. Compound that over the course of your life and the information could be worth tens of thousands of dollars. While I was in, I would have gladly paid a few hundred dollars for something like this. Fortunately for you, I’m only charging $20. That’s less than it would cost you for a nice dinner! Still not convinced? Listen to what others had to say about my eBook and training course. Hurry, this offer won’t last long! Order Your Copy Right Now! Just $20.00. Secure payment through PayPal. P.S. Even if you implement just one or two ideas from this eBook, you will receive a huge return on your investment! How much is your happiness and career success worth to you? Disclaimer: This course is in no way affiliated with, or endorsed by the Army, DoD or any government agency.